Winston Churchill was one of the two greatest democratic war leaders in history; Abraham Lincoln was the other. Between May 10, 1940, and July 26, 1945, Churchill served as both prime minister and defense minister of Great Britain during the most destructive war in human history. In the spring and early summer of 1940, he arguably saved western civilization. On the very day Churchill assumed office, Germany attacked France and the Low Countries. In a little over a month, France was defeated, and Britain faced Nazi Germany alone. Churchill recalled in the midst of this crisis that he was sure Britain would win; that he felt he was “walking with Destiny,” and that all his past life had prepared him to lead his country at the moment of its greatest peril. Events vindicated Churchill’s self-confidence. He was singularly prepared to lead Britain through the storm of war in part because he had served as both a soldier and war correspondent in Cuba, India, and Africa; led the Admiralty, served in the trenches on the Western Front and as Minister of Munitions and War Minister during the First World War; and again headed the Admiralty during the early months of the Second World War. Churchill also studied and wrote prolifically about military history and great military leaders, including Nelson, Wellington, and his ancestor John Churchill, the Duke of Marlborough. 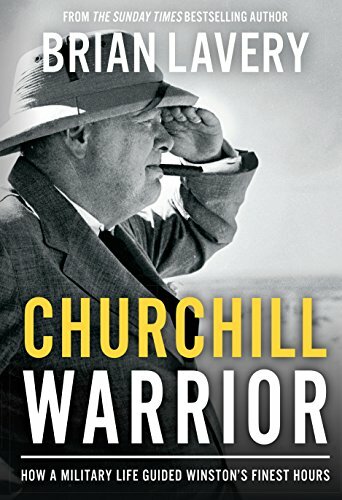 Historian Brian Lavery in his new book Churchill Warrior shows how this experience informed Churchill’s decision-making, administration, and strategy throughout the Second World War. Lavery claims that his book fills a gap in Churchill studies, but that ignores Carlo D’Este’s Warlord, William Manchester’s masterful three volume The Last Lion, John Keegan’s Churchill’s Generals, Stephen Mansfield’s Never Give In, and Eliot Cohen’s Supreme Command—all of which to varying degrees explored the impact of Churchill’s military experience on his statecraft. That said, Lavery does a nice job of tracing Churchill’s ideas, suggestions, and strategies during World War II to his earlier military experiences. For example, Lavery traces Churchill’s aversion to frontal assaults to his experiences on the Northwest Frontier of India and the Battle of Omdurman near Khartoum, as well as his study of the American Civil War. The strategic stalemate of the First World War led Churchill to champion the tank and an air force. His experience of inter-service rivalry led him to support combined operations and the appointment of supreme commanders for theaters of war and special operations. Churchill’s study and writing of history made him appreciate Britain’s need for allies on the European continent and its dependence on sea power for defense and survival. He had written about Marlborough’s and Pitt’s alliances against Louis XIV and Napoleon, and about the geopolitical significance of Trafalgar. Churchill fought in wars, studied wars, and commanded soldiers, sailors, and airmen in wars. But it was more than just his military experience that made him a great war leader. It was his courage, his indomitable will, and his ability to inspire his countrymen to make enormous sacrifices for the sake of victory that sets him apart from all democratic war leaders save Lincoln.